Can you receive and decode signals? If not, then you need to to make sure that your PC is being fed audio from the radio, and that your software is set to get sound from the right audio input. Not decoding? If using JT65 or FT-8, it’s important that your PC clock is spot on – over 0.5 seconds out, and the software may not decode the signals. Syncing your PC clock to an NTP (time) online server takes the hassle out of this. Is your PC able to put the radio into transmit mode? If not, then you need to look at the PTT settings in your digi-mode software. This can be tricky, and differs between all of the makes of radio, and the different software applications out there. You can use Windows Device Manager (Type “Device Manager” into the search box in Settings). 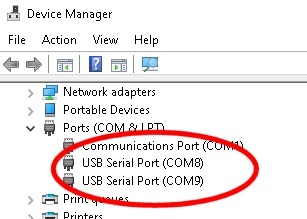 This will show you what devices are configured to what COM ports. For this test, you’ll need to get your software to send some audio in the format you’re looking to test (for example, some SSTV, or a long string of text in PSK31). 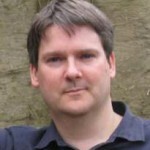 Is your digi-mode software using the right audio output? 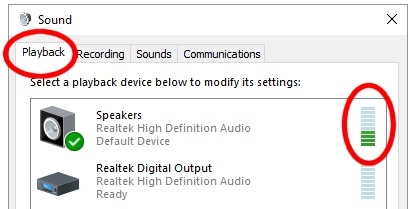 Assuming your PC is generating audio at a good level, then check the connection into the radio interface, and that the radio is set to receive audio from the interface. On my FT-857, I have to switch the radio to PKT before it will send data, otherwise it connects the mic to the audio stage, not the data input. Next, get your radio to transmit. 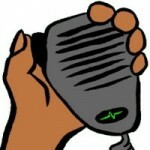 You should now be confident that your radio will go into TX (PTT) and your computer is putting out audio. If the radio has a display showing mic input, audio or AF MOD, take a look and see if audio is coming into the radio. A word of warning on Data modes – you don’t want to trigger the radio’s ALC (auto level control). If the ALC is showing, you’re sending too much audio. Reduce the volume being sent from the PC, otherwise the audio gets compressed by the ALC, messing the with transmitted signal.